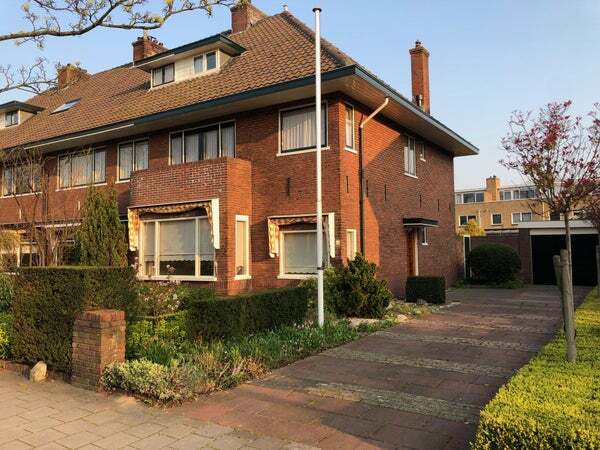 Beautiful townhouse in a popular location in the cozy Oegstgeest. The shops are within walking distance, as well as various parks, daycare centers, primary schools and secondary education. The house is also very conveniently located relative to the A44 The Hague - Amsterdam. The property has its own driveway for several cars, and a detached garage. The large and sunny back garden is pleasantly planted, and has many seating options. Behind the front door there is a spacious entrance with basement cupboard. The spacious living room has a solid parquet floor and a gas-fired fireplace. The kitchen has various built-in appliances, as well as a connection for washing machine and dryer. On the first floor there are three bedrooms and a spacious bathroom with a shower and bathtub. On the second floor there are two (bed) rooms, one with a sink. All rooms on the floors have a new laminate floor. The property is available immediately for a family, both for short and longer periods.